The journal is currently accepting articles in such field as analytical, general, inorganic, organic and physical chemistry; chemical kinetics and catalysis; chemistry of high molecular compounds; materials science and engineering; technology of inorganic substances and organic synthesis products; chemical technology of processing of combustible minerals; processes and apparatus of chemical and food productions; biotechnology and ecology. We are publishing results of scientific works carried out by the leading universities and institutes of Europe, America and Asia. 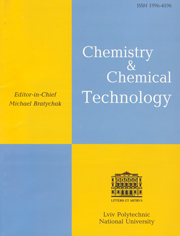 Starting from 2012 the journal Chemistry & Chemical Technology was accepted for coverage in selected Elsevier products (SCOPUS), included in the Сhemical Abstracts Service (CAS databases) and indexed in such databases as IC Journal Master List (ICV is 97.04 points for 2015); Vernadsky National Library; Electronic Journals Library GIGA German Institute of Global and Area Studies - Information Centre, Hamburg; Social Science Research Center Berlin; Vse Nauki; PUBDB DESY Publication Database; ZHdK Medien- und Informationszentrum; Elektronische Zeitschriftenbibliothek; Bielefeld Academic Search Engine (BASE); World Cat; ResearchBib.